Pre-Registration: Encouraged but not required. For PMI Maine Members who pre-register on-line, the cost of the event is $5.00; Cost for Non-Member who pre-register on-line is $10.00. Registration at the door is $20.00 for both Members and Non-Members. College students attend free if they pre-register online and present a student ID at check-in. Enter the discount code STUDENT when you pre-register on-line. Ron Taylor, PE, from the Maine Department of Transportation (DOT) will discuss the Sarah Mildred Long (SML) Bridge Replacement project, a strategically important initiative for the States of Maine and New Hampshire and the U.S. Department of Transportation. Ron is the Project Engineer for the joint Project for which the Maine DOT has the lead. His presentation will describe how this complex project is being managed from a cost, schedule and quality perspective and will include a discussion of the technical challenges, how contractors are managed, how risks are mitigated and how stakeholders from two states, the federal government and the local communities are kept informed. The presentation will also include a discussion of interesting discoveries that were encountered. The Sarah Mildred Long Bridge is a lift bridge that carries the US 1 Bypass over the Piscataqua River between Portsmouth, New Hampshire, and Kittery, Maine. The bridge is a double-deck truss bridge, with the US 1 Bypass road deck above and a railroad bed below. The bridge was completed in 1940. From 1960 until 1972, the bridge, along with the US 1 Bypass north of the Portsmouth Circle, filled a gap in Interstate 95, which had been designated along both the New Hampshire Turnpike and the Maine Turnpike. Although most of the bypass is four lanes wide, the bridge itself originally had only a three-lane roadbed, with traffic on the center lane switching direction depending on load (the bridge has since been reduced to just two lanes). This, combined with being a drawbridge, placed the bridge far below Interstate highway standards. The turnpikes, and therefore I-95 in the two states, did not directly connect until the opening of the Piscataqua River Bridge and the extensions of I-95 leading to it in the early 1970s. The railroad track that runs across the bridge was originally part of the Boston & Maine Railroad, and connected to South Berwick, Maine, via an easement that is now Route 236. The bridge replaced a railroad trestle that was located just upriver. The trestle collapsed on September 10, 1939, sending the engine (B&M #3666) and baggage car to the bottom of the river, where they remain. The trestle had been weakened when a caisson used in the construction of the new bridge dragged its anchor cables, which pulled out several of the trestle's bents. Currently, the tracks lead only to the Portsmouth Naval Shipyard in Kittery, and are used for the transportation of nuclear materials. For many years, the bridge was simply known as the Maine-New Hampshire (Interstate) Bridge. In 1987, the bridge was renamed to honor Sarah M. Long, who had been an employee of the Maine-New Hampshire Interstate Bridge Authority for 50 years. Starting with the agency in 1937 when the Authority was created, Ms. Long filled a number of positions, from secretary to executive director. 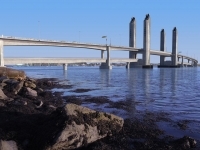 Due to its location in Portsmouth Harbor between the Memorial Bridge and the Piscataqua River Bridge, the Sarah Mildred Long Bridge is sometimes simply referred to as "the middle bridge" or "the old toll bridge". It has also been called the "Dime Bridge", in reference to the amount paid when it was a toll bridge. On August 21, 2016, the bridge became stuck in the closed position due to a mechanical failure On August 22, officials managed to partially raise the bridge to allow ship traffic to pass per federal law, which requires ship traffic be given priority over road traffic. It was deemed unsafe to further operate the bridge after the failure and it was decided to leave it partially open until demolition. It was determined by NHDOT and MDOT officials that the repairing the bridge would cost $1 million and take at least six weeks. The bridge was scheduled to close in November 2016 and construction of a replacement, scheduled to open to traffic in September 2017. As the scheduled permanent closure was just four weeks after the earliest possible re-opening, it was decided that the bridge would not be repaired. Its demolition was started earlier than originally planned. The premature closure of the bridge was announced on August 24, 2016. Major demolition of the bridge started in October 2016, with the overnight removal of the center span on October 14, 2016. The replacement bridge is under construction by contractor Cianbro Corp. It was designed by a joint venture of Hardesty & Hanover and Figg Engineering. 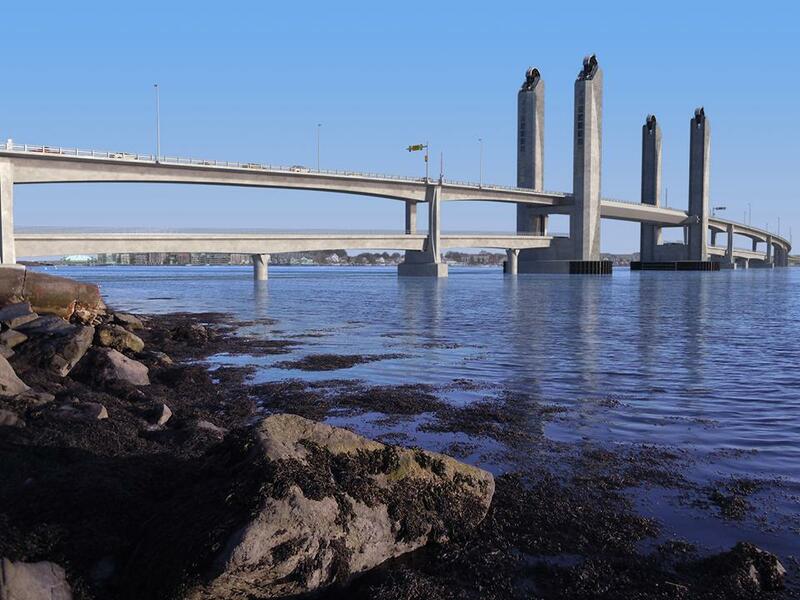 The replacement will be higher than the current bridge (with 56 feet of vertical clearance when closed), allowing for more ship traffic to pass underneath without opening the bridge. This height allows for 68% fewer openings than the old bridge required. It will have 11 fewer piers in the river, as well as an improved collision system in the event of a ship impacting it. The bridge deck will also have wider shoulders for bicycles. Maine and New Hampshire officials have negotiated a cost of $158.5 million with Cianbro, to conduct the work, which began early in 2015. $25 million was awarded by the U.S. Department of Transportation for the railroad portion of the work.